A knocked out Panzerkampfwagen V ausf A Panther is investigated by an American soldier. The tank "brewed up" and burned, causing the Zimmerit anti-magnetic paste (to prevent magnetic mines from being attached) to crack and burn off. There were 576 Panthers available to the Germans in Normandy between the landings on June 6 and August 25, 1944. Over 400 were destroyed, mostly by concentrated artillery fire and air attacks. As the remains of the German 7th and 15th armies were constricted to pass through the area of Falaise in August 1944, fighter-bombers (German: Jager-Bombern or "jabos") of the British Royal Air Force and the Americna 9th Air Force, mostly Hawker Tempests and Typhoons and Republic P-47 Thunderbolts armed with rockets, attacked the retreating Axis columns that were now forced to travel in the open daylight. While thousands of Germans escaped, hundreds of vehicles and artillery pieces and tens of thousands of men were killed. The rockets, while inaccurate, had the firepower of a broadside of a naval cruiser, causing devastating damage. Even the 80mm front hull armor of the Panther, which could not be breached by any Allied main tank gun, would crack under a hit from a airborne rocket. The Allies' air superiority was the chief means of dealing with the Panther; the number of Panthers and their superior armor and firepower took a heavy toll of American tanks. 37% of the Allied Shermans were casualties; the expected loss rate was 7%. The 3rd Armored Division alone lost 1,100 Shermans destroyed or damaged out of service in 1944-1945, a loss rate of 580%. The ausf A made up the majority of Panthers in Normandy. Benefitting from the inauspicious combat debut of the Panther at the Battle of Kursk, the ausf A had a machine gun for defense against infantry, and more reliable mechanics than the ausf D that preceeded it. 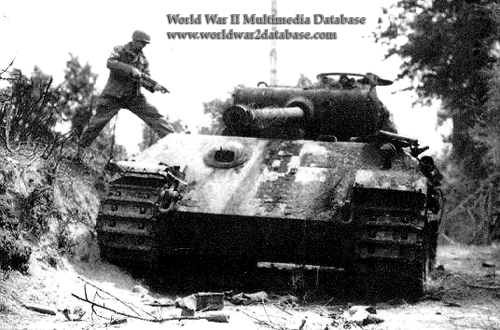 Still, the Panther required more maintenance than the American Sherman, which also greatly outnumbered it. 6,000 Panthers were produced against 50,000 Shermans and 50,000 T-34s.